[SINGAPORE] The need to create jobs and boost global economic growth took centre stage at the Spring Meetings of the International Monetary Fund's (IMF) policy-steering committee, the International Monetary and Financial Committee (IMFC), reported the IMF Survey, an online publication of the IMF. "Growth and jobs were a very strong focus of our discussions," said Finance Minister and Deputy Prime Minister Tharman Shanmugaratnam, in his capacity as chairman of the 27th meeting of the IMFC which took place over the weekend. "There was also a strong and common recognition that achieving growth and jobs cannot rest on one policy alone. 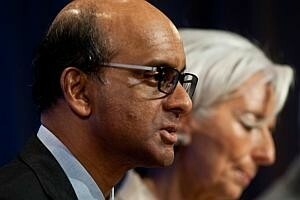 There is no single bullet that will get us to normal growth and some normality with regard to jobs," said Mr Tharman. The IMFC, which represents the IMF's 188 member countries, noted that an uneven recovery is emerging, but growth and job creation are still too weak. "We need to act decisively to nurture a sustainable recovery and restore the resilience of the global economy," it said. IMF managing director Christine Lagarde said that a mix of policies can help to move the world beyond the "three-speed" recovery - where some countries are doing well, some are on the mend, and others are lagging behind - that has emerged since the IMFC last met in October 2012 in Tokyo. "Every policymaker is keen to develop jobs and to respond to the demands of the young population in particular," Ms Lagarde said at a news conference following the IMFC meeting. "Anything that works to create jobs" is on the table, she said, "starting with growth and a good policy mix which relies on not just one policy, but a set of policies that will include fiscal consolidation at the right pace, structural reforms ... and monetary policy, which provides the breathing space". Policies to boost growth were also a focal point, said Mr Tharman. He said that the IMFC saw accommodative monetary policy as appropriate in the short term, but fiscal and structural policy action is also needed. "The emphasis was toward a better balance of strategies - monetary, fiscal and structural - with a strong emphasis on medium-term fiscal and structural reforms rather than an overly heavy reliance on monetary policy," said Mr Tharman. The IMFC's key priorities in the months ahead include focusing on jobs and growth as a basis for tailored policy advice, in collaboration with other organisations and the eurozone's progress in repairing bank balance sheets and reducing financial fragmentation. The committee will also closely monitor the sustainability of the Poverty Reduction and Growth Trust - an arm of the IMF which lends to the world's poorest countries - in relation to the needs of low-income countries, and conduct further analysis on the impact of unconventional monetary policy on capital flows and asset and commodity prices, the role of capital flows in driving exchange rates, and global liquidity.